Do you like Gold Strike? Share it with your friends. 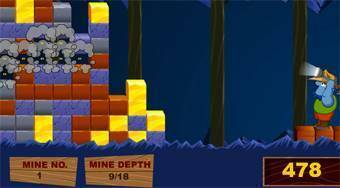 In each level of this game, you try to remove cubes of the same rocks, which mutually touch each other, from the game area. Remove the valueless cubes of stones in such a manner that as much pieces of the precious gold as possible get together. However, be careful, as even mining of seemingly worthless rock can bring a lot of money, if a diamond is hidden in it.